Aerial view of Ardnacrusha The Shannon Hydroelectric Scheme was the largest engineering project undertaken in Ireland and in its early years could almost support the electricity needs of the entire state. After Independence the Irish Free State Government started on an ambitious programme of reconstruction and development for the country. A major objective of this programme was the provision of a cheap, reliable and plentiful supply of electricity. 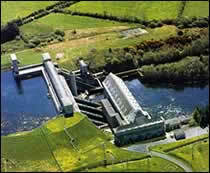 The Shannon Hydroelectric Scheme was constructed between 1925 and 1929 to meet this objective. The scheme was the brainchild of Dr. Thomas MacLaughlin a graduate of UCG. He joined Siemens Schukert in Berlin in 1922 and worked on developing the concept of harnessing the power of the River Shannon to produce electricity. The works involved the diversion of 90% of the Shannon into a head race canal 7.5 m long by which the water was delivered to Ardnacrusha, where a fall of 34 m was available. After passing through the generators at the power station the spent water was conveyed back to the Shannon by means of a tail race canal. The chief Civil Engineer on the project was Frank Sharman Rishworth from Tuam, who was at the time Professor of Civil Engineering at UCG. On completion of the scheme considerable work was carried out on developing the electricity grid, stretching the length and breadth of the country. The construction of a transmission system for the entire country, even very remote areas, was referred to as the "Rural Electrification Programme". In 1929 the Shannon Scheme was completed and handed over to ESB. In its early years the station could practically support the electricity needs of the entire nation. The highest proportion of system demand supplied by Ardnacrusha was 87% in 1936/37. Ardnacrusha was also the headquarters of ESB until 1954. By 2000 Ardnacrusha supplied only about 3% of the annual demand but it is still vitally important to the system as a 'rapidly available' source of power and for cover in cases of emergency or sudden breakdown of plant.